Summer of '42: 39¼" x 21"
Shark Sighting: 37½" x 23"
Here for your consideration is an exclusive TWO-PRINT SET by aviation artist extraordinaire John Shaw featuring the American Volunteer Group led by Claire Chennault - the Flying Tigers. 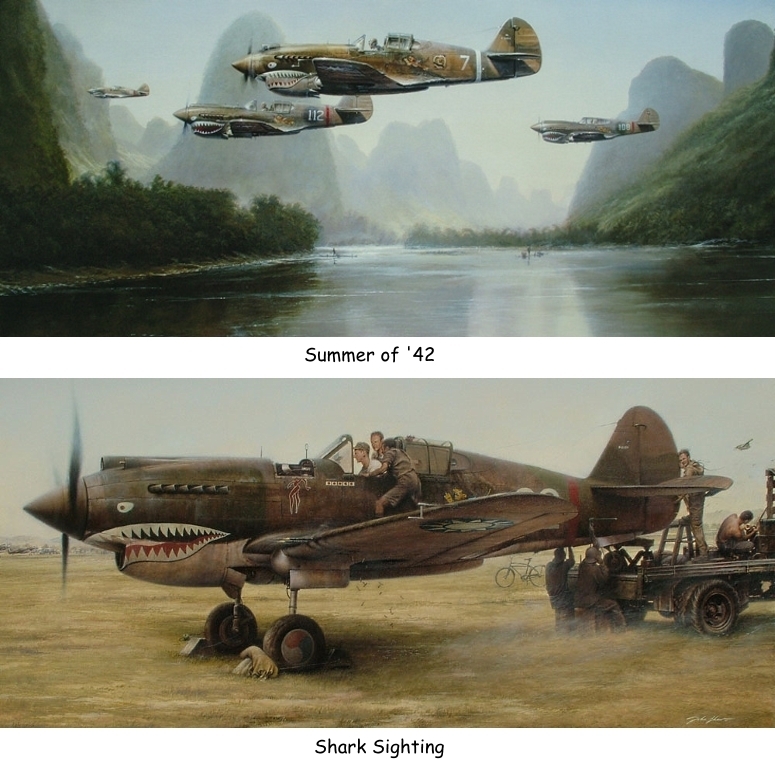 Included in the set are "SUMMER OF '42: A TRIBUTE TO CHENNAULT'S FLYING TIGERS" (Main Edition) and a like-numbered "SHARK SIGHTING" (Main Edition). Each print is from a signed and numbered limited edition. Don't miss this UNPRECEDENTED opportunity to own these TWO amazing prints with the SAME PRINT NUMBER in their respective editions! During 1941, as the cruel cloud of Axis tyranny spread throughout the East, the brave men and women of the American Volunteer Group, under the command of Claire Lee Chennault, were the first Americans to successfully resist Japanese aggressors over China. Nicknamed the Flying Tigers, and armed with little else than a batch of Curtiss P-40 fighters rerouted from lend-lease delivery to Britain, the AVG was divided into three squadrons known as the Adam and Eves, Panda Bears, and Hell's Angels. Living and playing hard, they swung into first action in the skies over Burma and China about 2 weeks following the attack on Pearl Harbor, and immediately began a series of aerial victories that would become the stuff of legend. By the summer of 1942, the U.S. Army Air Corps had established a base at historic and exotic Kweilin, China, and planned to induct as many of the AVG as possible back into official U.S. service. Before the pilots of the legendary American Volunteer Group could take to the skies against the enemy, armorers had the all-important task of sighting the weaponry of their Curtiss P-40 Tomahawks out on the firing range. This involved leveling out the aircraft and fine-tuning the aim of each .30 caliper wing gun on a target set about 300 yards away. When the fire of all four converged, the result was devastating, as the AVG's record of over 300 enemy aircraft destroyed or damaged could attest.